Saturday August 29th was a busy day at Golden Oak Stables. 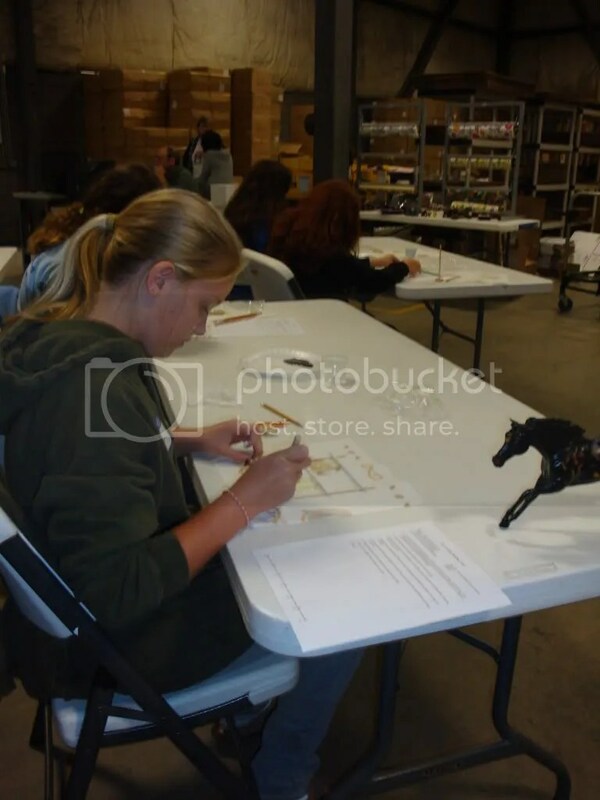 The doors welcomed 17 eager hobbyists to learn all about model horses. 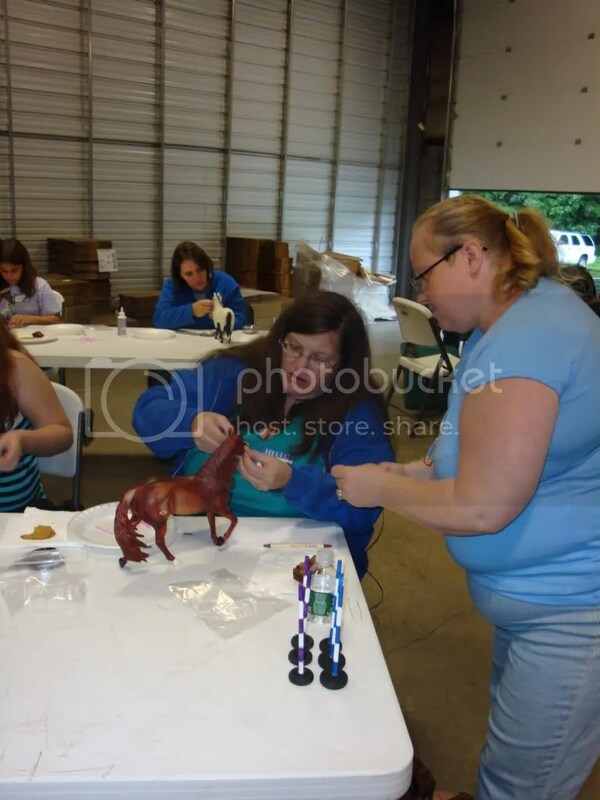 Golden Oak Stables’ first annual workshop day started off with prop making. Linda Carrier artfully lead the group through making a set of speed poles for their horses. Everyone completed a set of three that they took home to use with their own horses. Linda is a familiar face to Golden Oak Stables judging at all three of our previous shows. After prop making was finished we stopped for a pizza lunch complete with chocolate chip cookies! With stomachs full the group sat back down for a class in halter making with Bev Lynch. Bev is a new face to some but with her large amount of real horse experience she’s quickly showing her talent for model horses. Some attendees brought favorite horses to make their halters on while others borrowed horses that would be used for the etching class. At the end of the class everyone had a new halter for their horses at home and had learned how to complete the project at home as well! 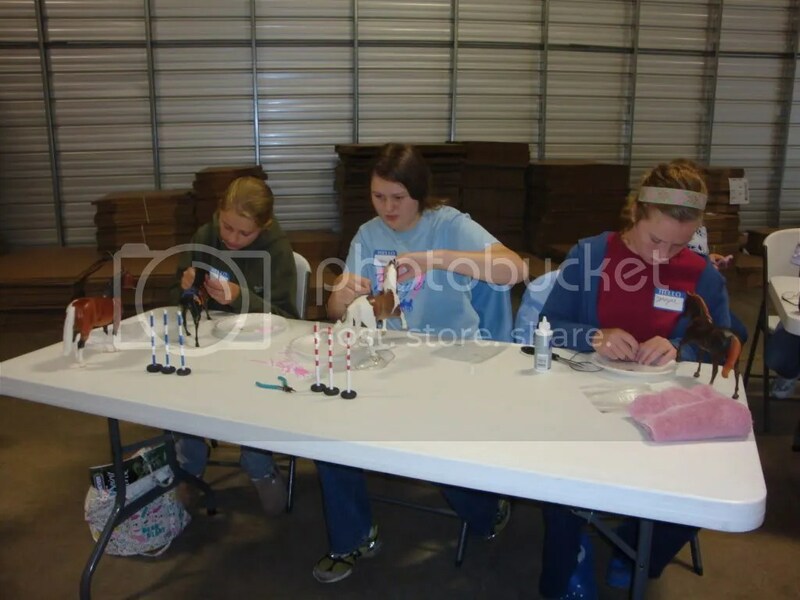 Our last workshop was led by myself, Stacy Becker, and was Etching. Etching is a form of customizing model horses where you use a craft knife to “draw” on the individual hairs of a horse. Everyone took to this like a fish to water and there are some true etching talent in the audience that day! 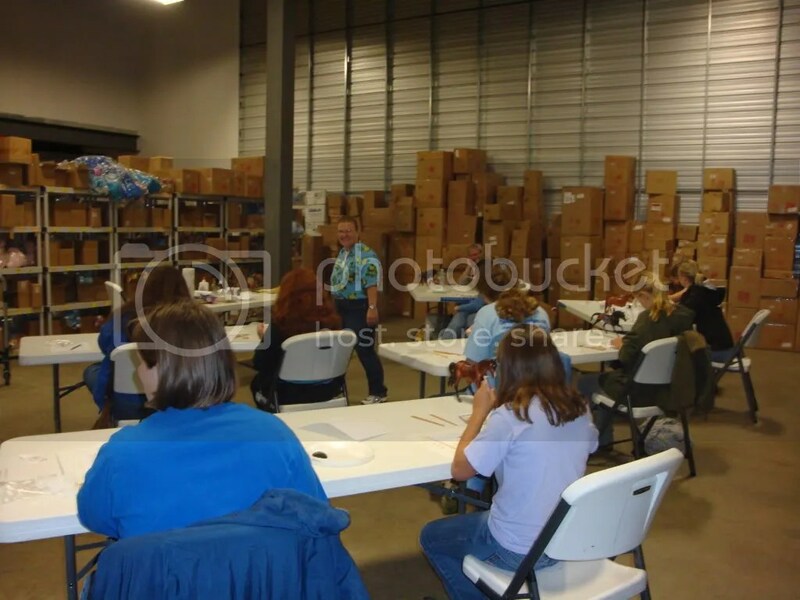 At the end of the day it was truly a rewarding experience for all instructors to teach skills to a new group of hobbyists, and it seemed like most everyone was happy with their newly found knowledge. We are looking forward to our next event, our first NAN Qualifying open show on October 24th 2009! Hope to see you there! Last week we did a bit of Breyer horse restoration. Removing acrylic paint is a lot of work but can produce great results. Last week we loosened the paint and removed the larger portions of it. This week we’re going to work on the mane and tail. If you haven’t had a chance to take a look at last week’s part one, you can click here to read it. After you’ve removed the larger potions of acrylic paint you’re going to notice what’s left is very stubborn. Paint that slips into the crevices and into creases is difficult to get out and harder to remove. If you’ve taken a break in between steps you’ll want to once again soak your horse. This loosens the paint. 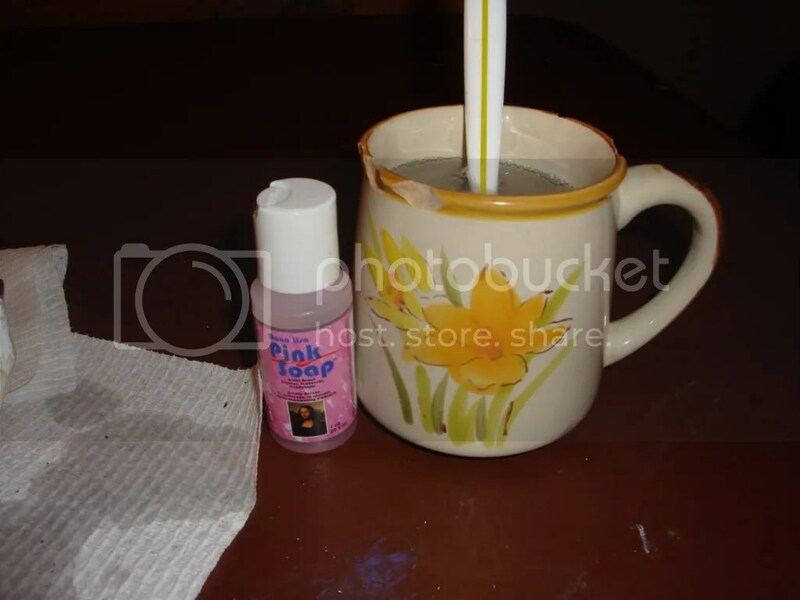 Acrylic paint is water soluble, so water is going to be one of your greatest weapons against the paint. 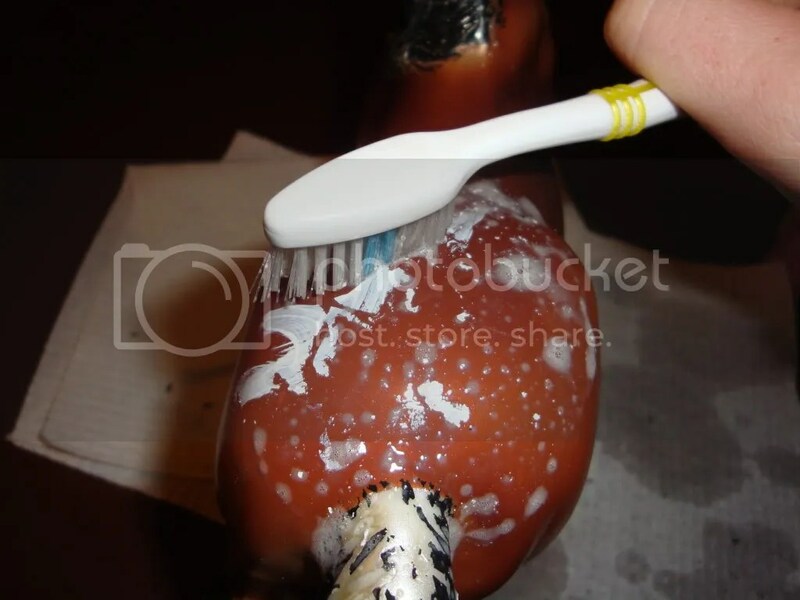 Once you have soaked the horse, you’ll want to start scrubbing it again with the toothbrush and acrylic soap. Again, you want to loosen this as much as possible. Dry paint will be almost impossible to remove. This might even remove a bit more of the paint and save you a bit of trouble. 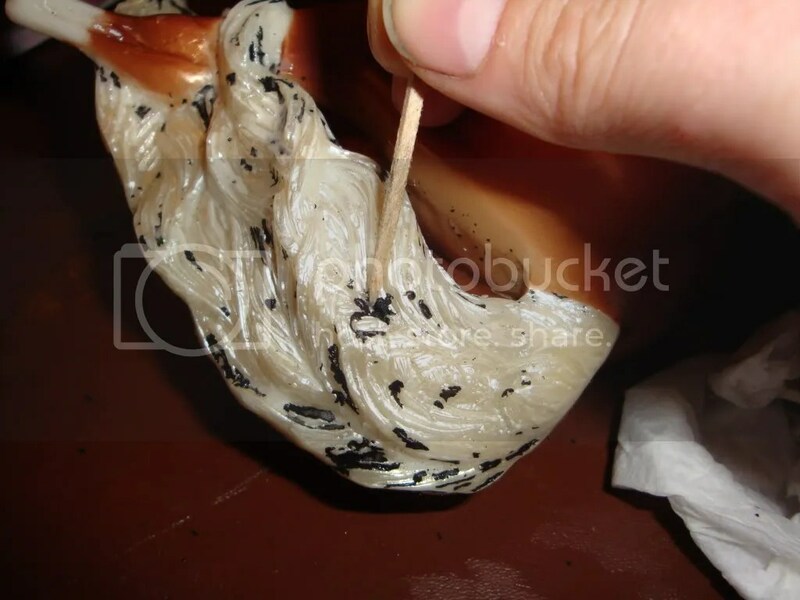 Once your paint is soaked and loosened you’ll want to get some toothpicks and start to loosely pick at the paint, getting into the crevices and lightly picking and scratching at the paint. If the model you are working with has a bare plastic tail (This is common on models with a white mane and tail) you don’t need to be as careful when picking and scratching, but if your model has a painted mane and tail be VERY careful not to scratch off the original paint. Take your time and pick at the paint until it is all removed. If you are still having difficulty another soak and scrub with the toothbrush and soap is in order. For difficult paint this may need to be done several times. Use care and patience and the paint will be gone in no time! 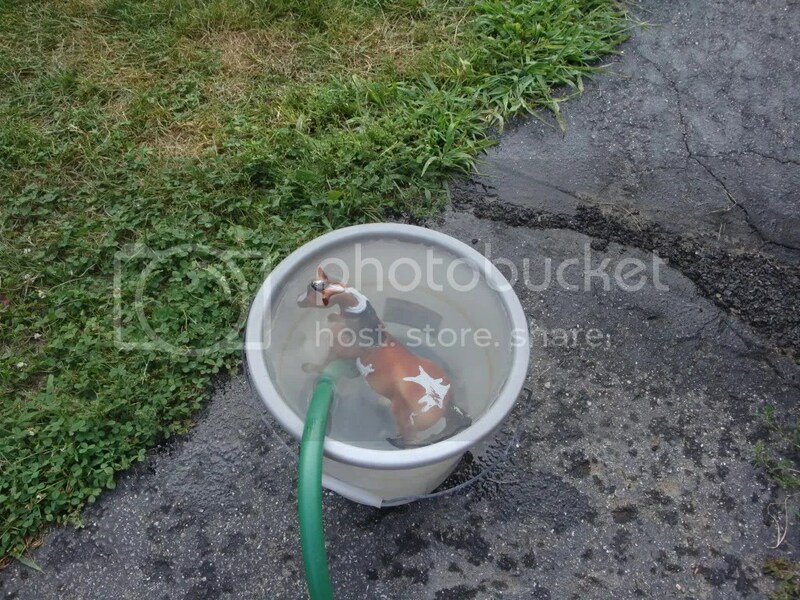 After you feel like you’ve gotten all of the paint on give your horse another soak in a bucket. Leave it sitting in there for an hour or so and wipe it off with a wash rag or paper towel. Your model should now be done! Patience will get you very far when you are restoring models. Don’t rush and take your time. If you are in the Concord, NH area drop on by tomorrow to Golden Oak Stables for our Fun Day and Workshop Day, drop me an email for more information! 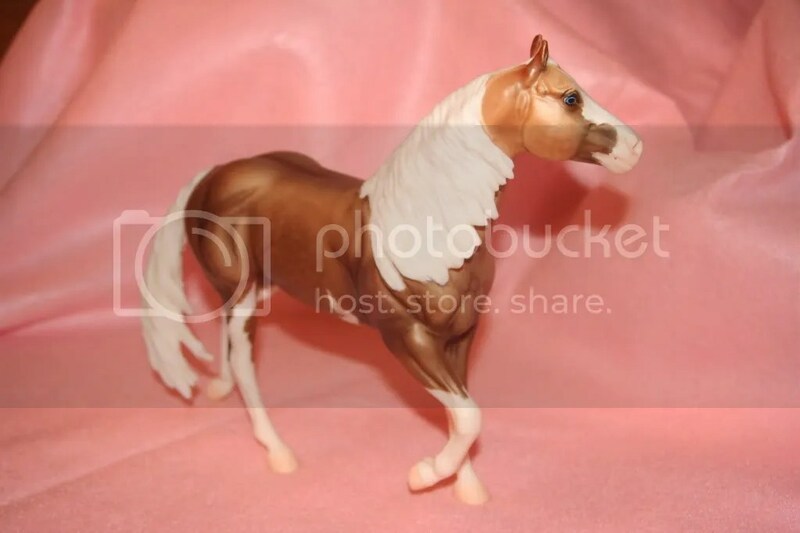 Idocus is a brand new Breyer model for the year of 2008 and is making a huge impact already! This beautiful Dutch warmblood is immortalized with a new sculpture that will honor him for years to come. The real Idocus is an 18 year old bay Dutch Warmblood, In his 18 years he has created quite the stir. With huge winnings and numerous titles that would make any rider proud. Idocus is the only stallion to have been bred in the Netherlands, trained and competed in the United States and then go back to the Netherlands for “Approval”. In 2001 he was brought to the Netherlands for vigorous stallion testing in which he passed. Then in 2004 Idocus was welcomed back to the Netherlands as a part of their Olympic team, a huge honor for an American trained horse. Courtney King-Dye and Idocus have become one of the most successful US horse and rider pairs in the discpline of dressage. The Dutch-bred Idocus finished sixth in the 2007 World Cup Final in Las Vegas, NV. In 2008, they were #1 in the World Cup standings for the North American League and qualified to represent the United States at the World Cup Final in the Netherlands. 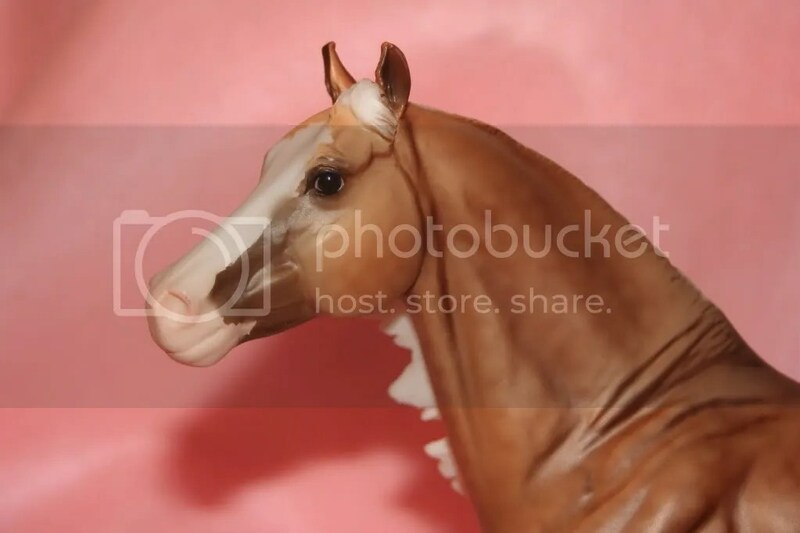 The Breyer Idocus is a fitting portrait of the dressage champion, and is featured in a calm standing position in a beautiful metallic dapple bay. Golden Oak Stables was proud to introduce him in the spring of 2009 and has only been offered to the public in the standard metallic bay. 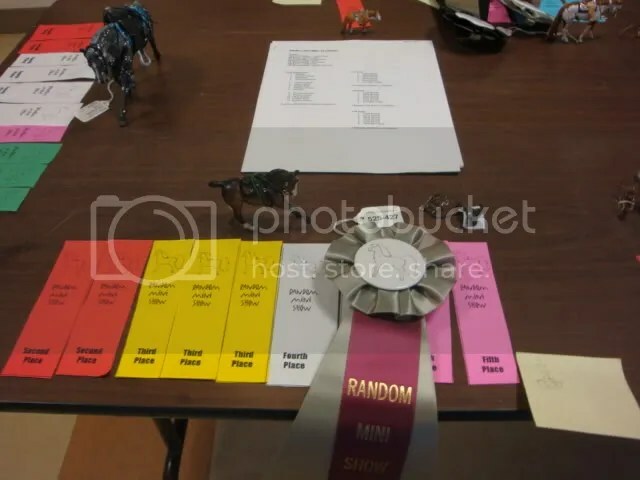 At Breyerfest 2009, Breyer honored winning showers at their Breyer Model Horse Show with glossy variations of Idocus. This model was limited to only approximately 30 and will never be offered again. The only difference between the regular run Idocus and the one given away at the Breyerfest Live Show is the glossy finish. This does make the horse much more collectible but does not really change the “look” of the model. The model Idocus can be shown in halter and could be shown creatively in performance. He could be shown as a variety of European Warmbloods. In performance you’ll have to get creative, but theres tons of possibilities if you do your research, he could be standing in the Cross Country gate waiting to go, or standing on the trail enjoying the scenery with his rider. The possibilities are endless! Idocus may be a new face to the Breyer line but he is sure to be a favorite for years to come. A new sculpture is an honor only given to select horses and Idocus is truly one of them. 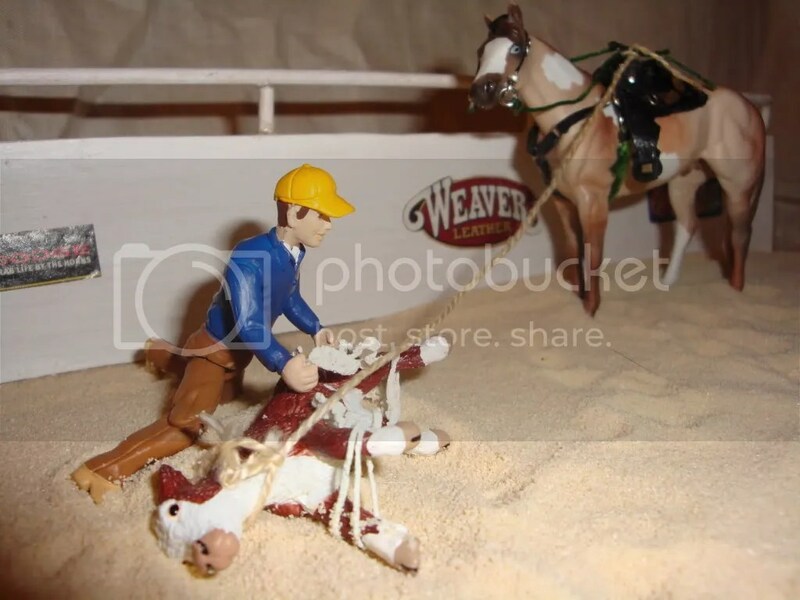 Breyer stablemates are collectible and favorites among many collectors. Their size, variety and price makes them easy to collect and fun. These horses are around 3 inches tall or 1/24th scale. Breyer has been making Stablemates since 1975 and currently has over 30 different stablemate molds. With breeds ranging from Pony to Draft as well as 1/2 a dozen foal models, the variety that is offered is grand! One look on the Golden Oak Stables’ site will bring up dozens of Stablemates that are ripe for collecting! In my collection I’ve collected over 400 Stablemates! With them priced around $3 a horse and under $20 for most sets, its very affordable to start this “tiny” collection. 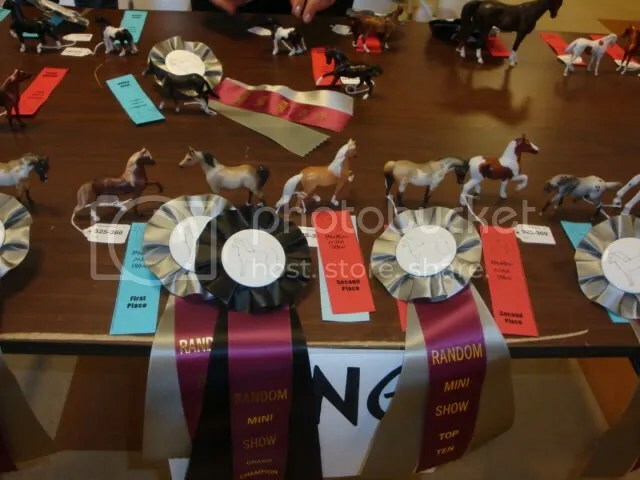 Not only are they fun to collect but they are also competitive show horses! 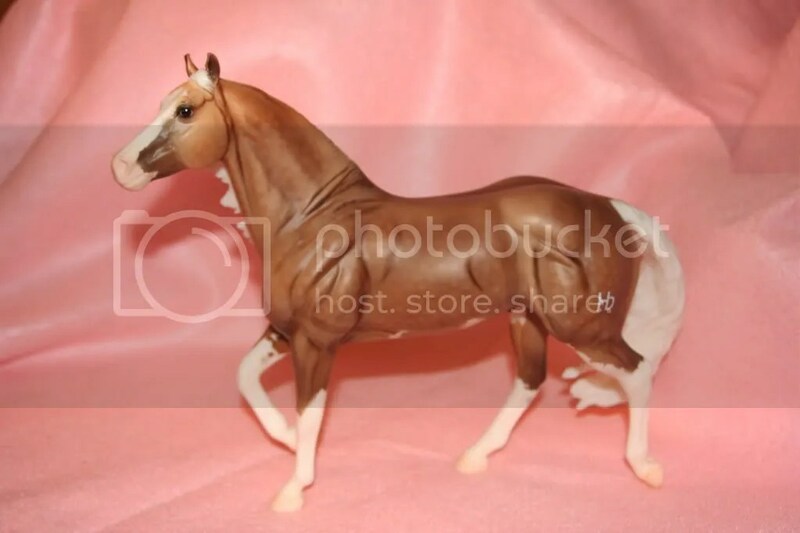 The Stablemates are some of the most realistic horses that are offered in Breyer’s line and their size does not effect their ability to be shown! At our first Golden Oak Stables‘ show, a simple Original Finish Stablemate was one of the big winners! You can even see her in the Just About Horses’ Winners Circle this month! There are special shows as well that cater to smaller scales, including Stablemates. This provides an even playing field for smaller horses that may have gotten overlooked when put on the show table with the big guys. But don’t count them out in the big show ring either! They can hold their own in most cases! There are also people that show their Stablemates in performance, making custom tack for their horses. The challenge of creating and showing tack for one of the smallest scale of horses is a fun for some collectors, including myself, and creating in extreme miniature is also a large pull. There are dozens of artists out there creating tack specifically for Stablemates only. Stablemates are versatile and easy to collect. They are easy to afford and you can fit many more on a shelf than you could with traditional models! My only advice is that they are like potato chips, you can’t have just one! In honor of Golden Oak Stables‘ workshop day being held next weekend I wanted to do something a little special. 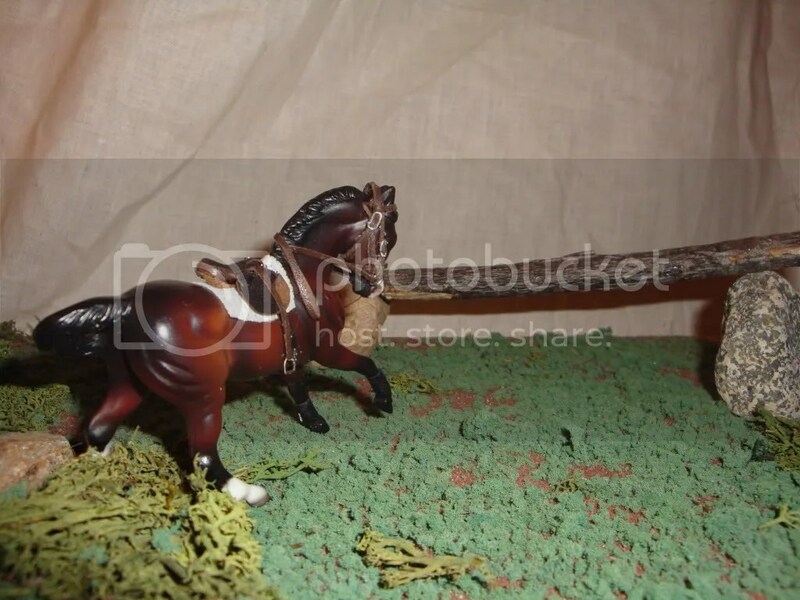 Today we’re going to take a look at Breyer horse restoration. Breyer horse restoration is a very complicated trade, it takes hours of time and years of skill, but done correctly it can produce beautiful results. 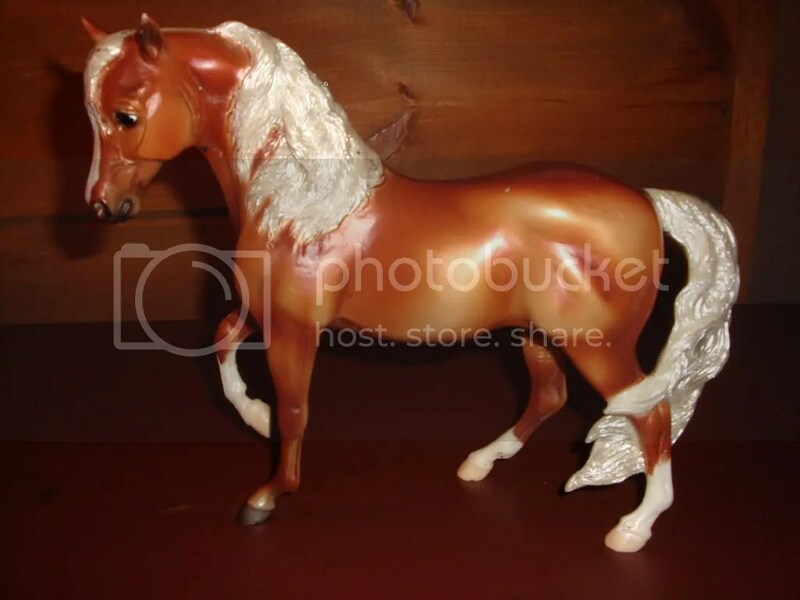 Breyer horse restoration artists are few and far between and finding a good one is hard, for today we’ll focus on something that you can try yourself. Everyone has done it once, gotten excited about repainting and slapped some paint on a beloved model, and even if you haven’t, you’ve probably come across one in your travels that was badly repainted. 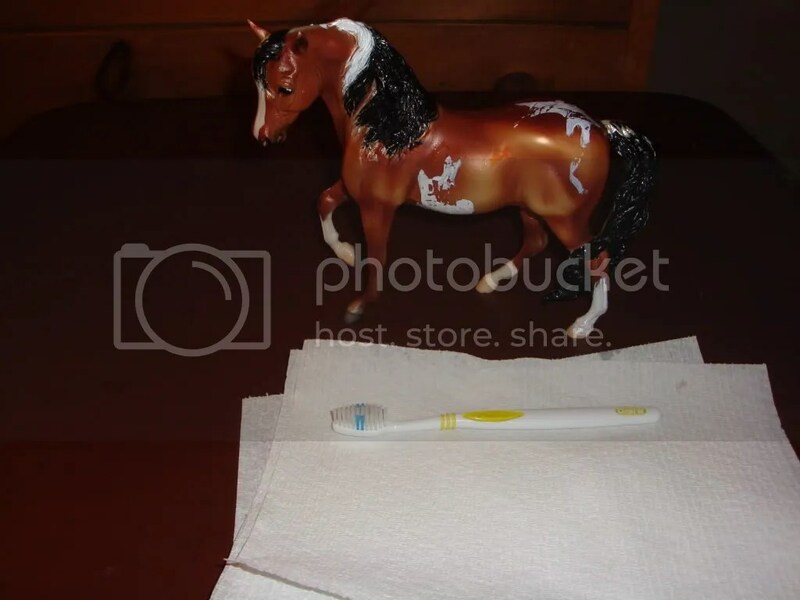 Today we’ll learn part one of removing acrylic paint from an original finish Breyer Horse. Restoration takes hours upon hours, and can be extremely frustrating. I would only suggest doing it if the horse is rare, hard to find, or sentimental. There are times when its just going to be cheaper to buy a new model. 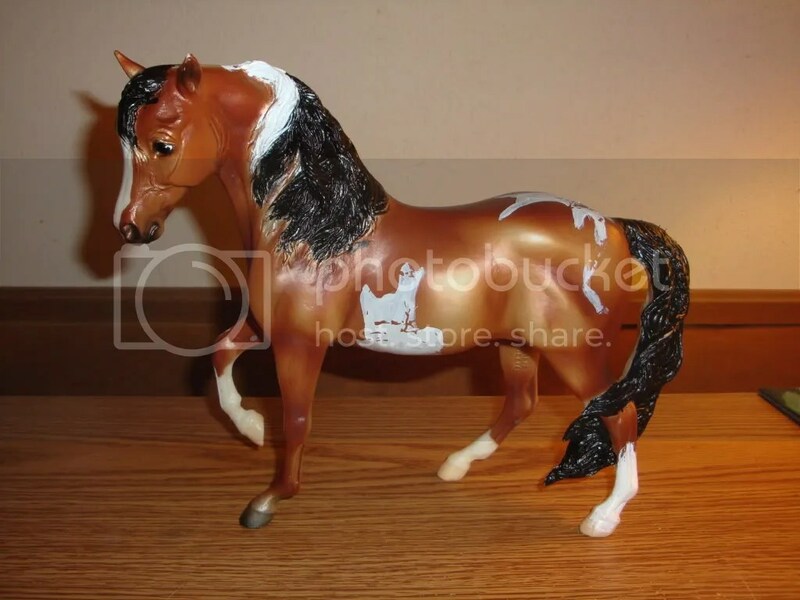 This Breyer has been repainted using Acrylic paint. Acrylic paint is a water based and water soluble paint that is commonly used for painting Breyers. You can check if the paint is acrylic by trying to flake it lightly with a fingernail. Be VERY careful not to scratch the model. If it flakes easily, its probably acrylic. The first step is to initially loosen the paint. 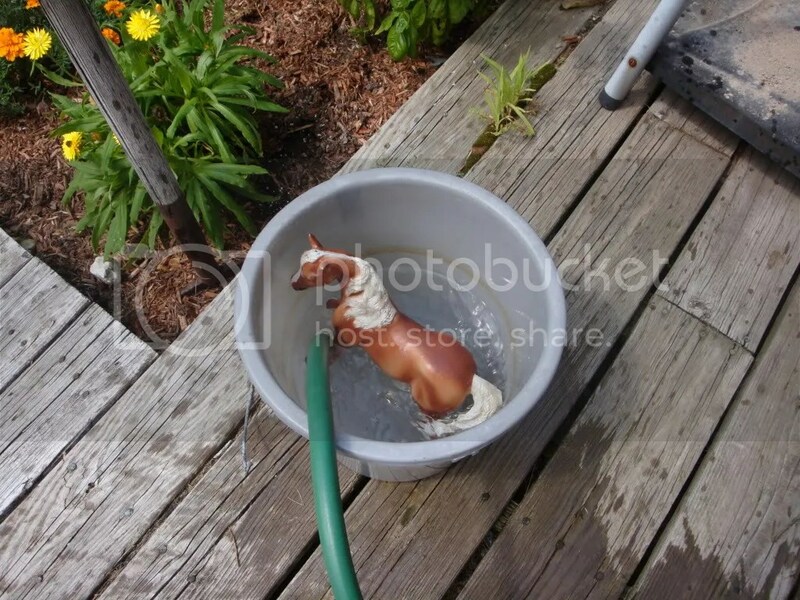 Place your horse in a large bucket and fill it up with water. Its best to do this outside so that you don’t make a bit mess indoors. You may need to use something to weigh your horse down, Breyers are hallow and will float, wet rags work well for this. Start off by leaving him in there for a few hours. After that you’ll want to work on your horse immediately. Using a clean toothbrush start scrubbing lightly. Areas of paint on the body will be easiest to get off. Manes and tails will be difficult. There are crevices that require lots of time and detail work, we’ll cover that in part two. At this time though you can start loosening it by scrubbing it too, but don’t expect it to come off on your first try. If you still have stubborn paint on the body after scrubbing with the toothbrush, try using a bit of acrylic brush soap. Acrylic brush soap is created to remove acrylic paint from paint brushes, and it works similarly by loosening the paint. Next week we’ll finish up with the mane and tail. Don’t give up! This takes time but at the end you’ll feel so great knowing you brought back a horse to its former beauty! One of the most popular Breyers in a long time is the fantastic Big Chex To Cash. Debuting in the fall of 2008 he’s quickly become a fast favorite and popular in the hearts of many collectors. The real Big Chex To Cash is just as popular and interesting! Big Chex To Cash was foaled in 2002 and At only seven years old, the stunningly gorgeous palomino overo has lifetime earnings of over $200,000 and holds the title to multiple national reining championships. His palomino sire, Nu Chex To Cash, is one of reining’s all-time leading producers, having earned more reining points than any other horse in the American Quarter Horse Association’s history, as well as being the only horse to have earned AQHA High Point Reining and High Point Working Cow Horse in the same year. Owned by the 23 Partnership in California, it was not until the late fall of 2004 when paired with NRHA’s million dollar trainer Andrea Fappani, when the talent Big Chex had been bred for became evident. That year, the pair won the West Coast Spectacular Futurity and the NRHA Futurity Reserve Championship with impressive sliding stops and powerful, controlled turnarounds. But the wins didn’t stop there! Also in 2005, Big Chex was the Equi-Stat All-Age Leading Reining Money-Earner, the Equi-Stat Reserve Champion 3-Year-Old All-Divisions Money-Earner and the winner of an NRHA Open Futurity Bonus.“Big Chex To Cash has had a great career. We couldn’t be more thrilled with his successes, and we’re very excited to have him immortalized as a Breyer Portrait Model,” said the stallion’s trainer/rider Andrea Fappani. The deeply dappled stallion, with his flashy palomino overo coloring including four white stockings, a bald face and one blue eye, continued competing with Fappani in 2006, earning fifth in the Las Vegas Reining Classic Open Derby. The pair returned to reining’s spotlight with a vengeance in 2007 with the NRHA Open Derby Reserve Championship and the Reining by the Bay Derby Co-Championship titles. The handsome stallion currently stands at stud in California, through Fappani Performance Horses. The Breyer Big Chex to Cash is happily offered by Golden Oak Stables and is a favorite to collectors alike. 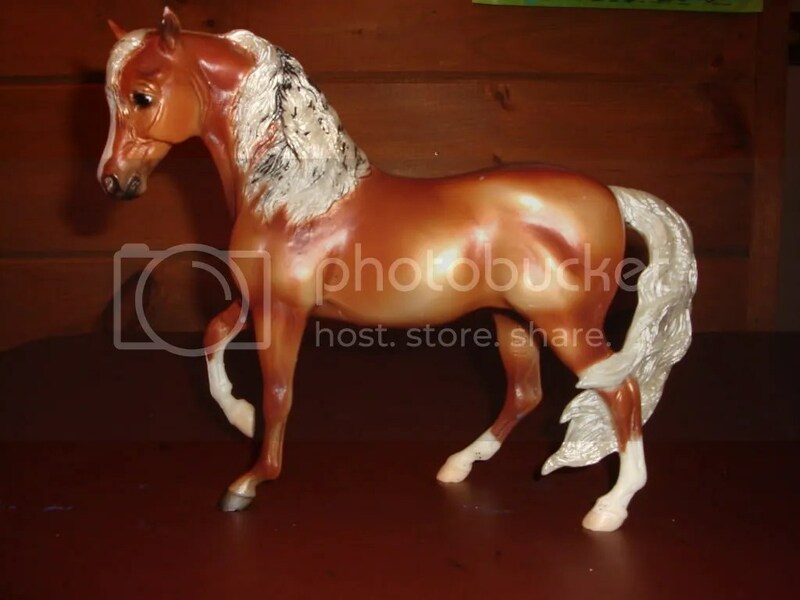 His paint job is one of Breyer’s most complex to ever be offered into its regular run line and his beautiful dappling, pinto markings and blue eye all make him stand out to all. Most of the Big Chex To Cash models are painted with metallic paint as well. His showing future is bright making a great performance horse as well as making a great halter horse. With his detailed paint job he can stand out on a table! He is painted on the Smart Chic Olena model, a model that has honored several famous western horses. You are currently browsing the Stable News blog archives for August, 2009.